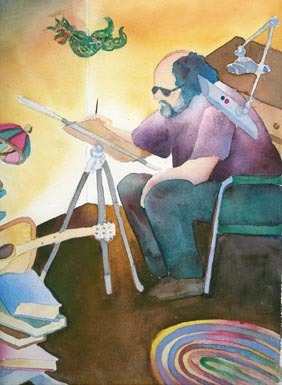 As a beginning artist, a friend of mine informed me that all "serious" artists periodically create a self portrait. Well, I have always taken myself a little too seriously, so I went right home, sat in front of the mirror and began painting. Because I was staring intently, my eyes turned out as big as half dollars. In fact, some said I looked slightly "crazed". (Aren't all artists?) My friend was right about one thing though. Over the years it has been a great creative assignment which has documented my development as an artist. SHAPES: What is your favorite design element? Shapes have emotional impact. Is there a geometric pattern which could be used as part of your painting? Are you drawn to rectangles, circles, triangles or lines? COLOR: Colors have emotional impact. For example, "I have the blues!" What is your favorite color (today)? Let a color dominate that best expresses what you are seeking to communicate. ENVIRONMENT: Where could you place yourself that would say something about you? TOTUM: What are some objects that you could stack up to represent events in your life or characteristics of your personality? SEND INTO THE WORLD? What is valuable to you? What would you like to send into the world? SYMBOLS: If you had to represent yourself with a still life, what would be in it? DOODLES: What symbols, shapes or marks keep showing up in your unconscious drawings? Once you have filled out the questionnaire give yourself time to process your answers. A bright idea will come; especially if you take a light hearted approach, not taking yourself too serious. The portraits will result in a journal of your artistic journey which can give you a lot of pleasure.